Cloud isn't just about advancing IT; it's about reinventing your business. Organizations that approach cloud in a tactical fashion risk adding complexity and inefficiency (not to mention security exposure) due to fragmentation, redundancy, and operating silos. Organizations that embrace cloud strategically from a business as well as IT perspective, can capture new business value through innovation, flexibility, and speed, while still reducing cost and complexity. 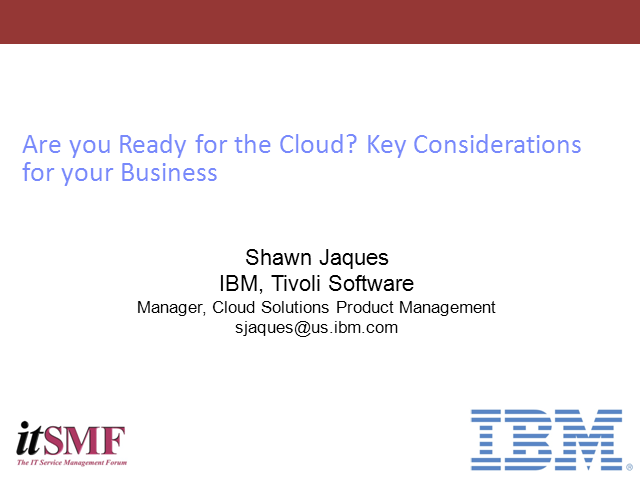 In this webcast, you will hear Shawn Jaques, Manager, Cloud solutions at IBM, discuss a list of forward-facing tips that can help you prepare for cloud with a staged deployment strategy for building and managing private clouds — when you're ready.